Access the HubSpot sales tools directly in your inbox when composing emails with the HubSpot Sales Chrome extension installed. Please note: to use your meetings tool in Gmail, you must have a connected calendar. To use your sequences tool in Gmail, you must have a connected inbox. When you're composing an email in Gmail, insert a block of text using a snippet. Compose a new email in Gmail and add a recipient. In the composer window, click Snippets. Select a snippet to add to your email body. 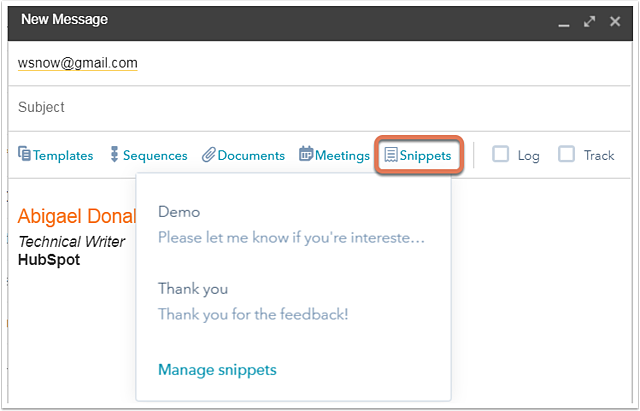 Or, click Manage snippets to go to your snippets dashboard in your HubSpot account. You can insert one of your sales templates in Gmail. In the composer window, click Templates. 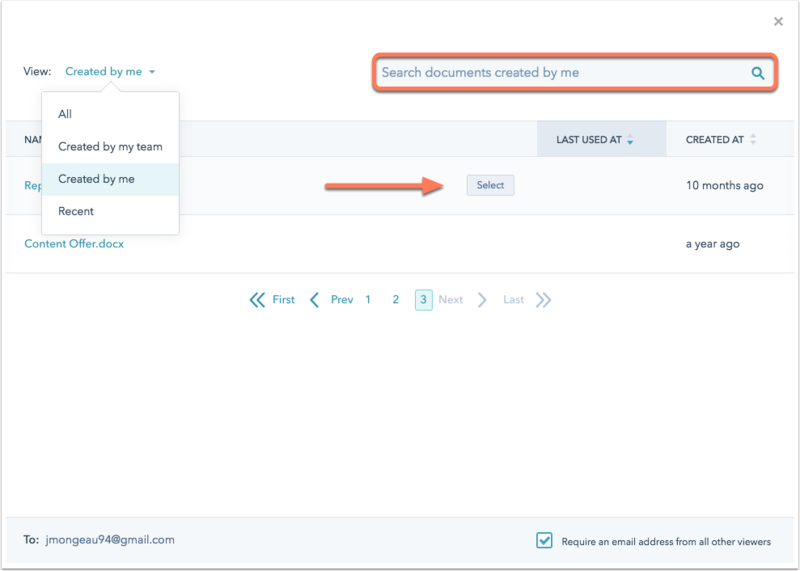 Use the search bar at the top of the dialog box to search for a template by name or click the dropdown menu beside the search bar to filter your templates by All, Created by my team, Created by me, and Recent. Open Gmail and locate a sent email you would like to save as a template. At the top of the email, click Save. In the dialog box, enter a name for the template and make edits as needed. In Gmail, you can insert a document link to track who's viewing your documents and see the data in HubSpot. In the composer window, click Documents. If you choose to, select the Require an email address from all other viewers checkbox to collect an email address from anyone else besides your recipient who views the document. Hover over the document you wish to use and click Select. A link to the document will appear in the email body. To change the raw link into hyperlinked text, click the link and select Change. In the dialog box, enter the link's text in the Text to display field. Then click OK. Instead of manually copying and pasting your meetings link, you can directly insert one of your meetings links in a Gmail email. In the composer window, click Meetings. The name of the meeting will be inserted into your email, and it will be hyperlinked with your meetings link URL. 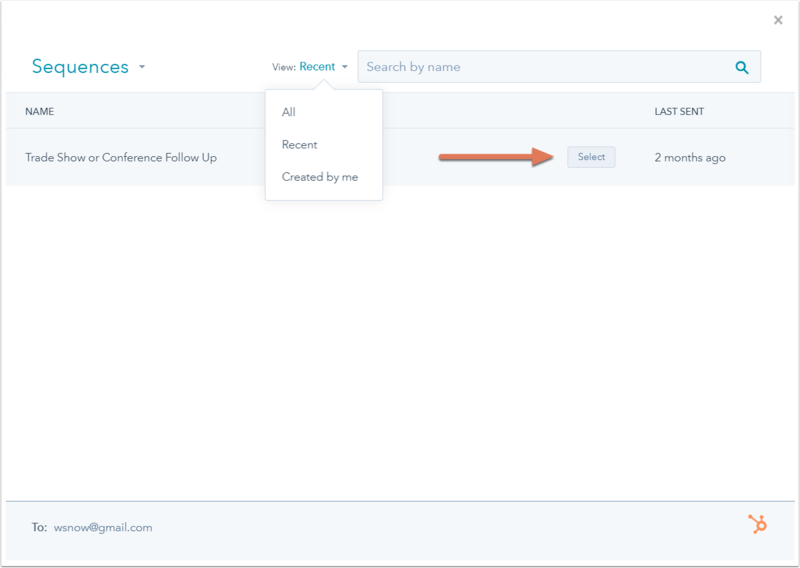 To change the link text that recipients see, click your meetings link in the email body and select Change. In the composer window, click Sequences. 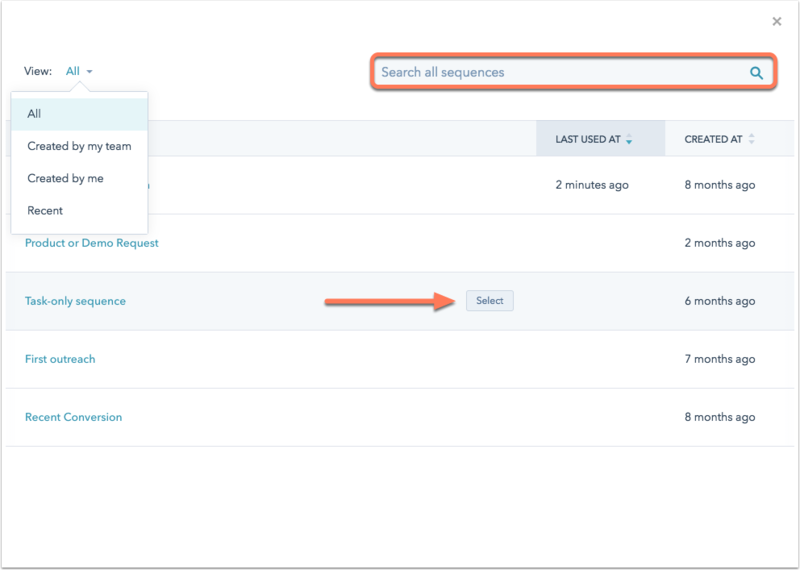 In the dialog box, use the search bar to search for a sequence by name, or click the dropdown menu beside the search bar to filter your sequences by All, Created by my team, Created by me, and Recent. The Last used at column is user specific, so it will show the sequences that you last sent. You can sort your sequences by the Last used at or the Created at column. Hover over a sequence and click Select. In the next window, customize the body of your sequence templates and your sequence settings. 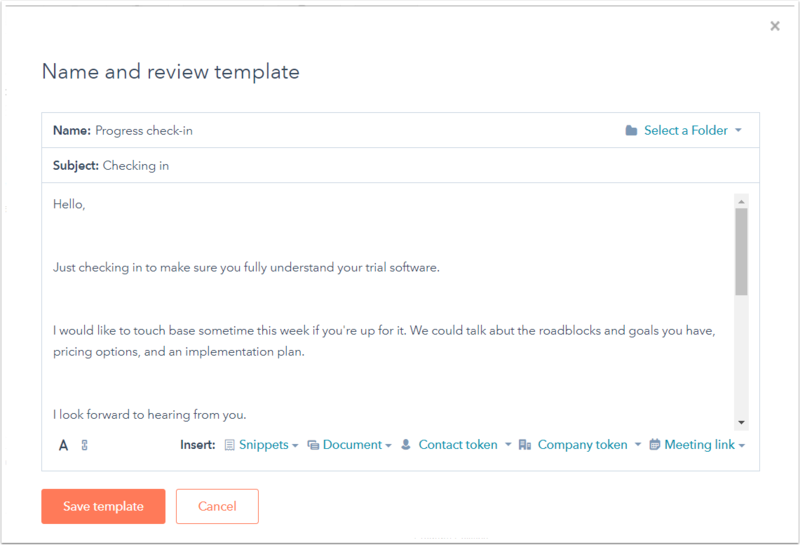 If you're a Sales Hub Professional or Enterprise user, you can use sales email recommendations and surface insights about your contact to help tailor your email content. Click the Low personalization alert to review the suggestions. 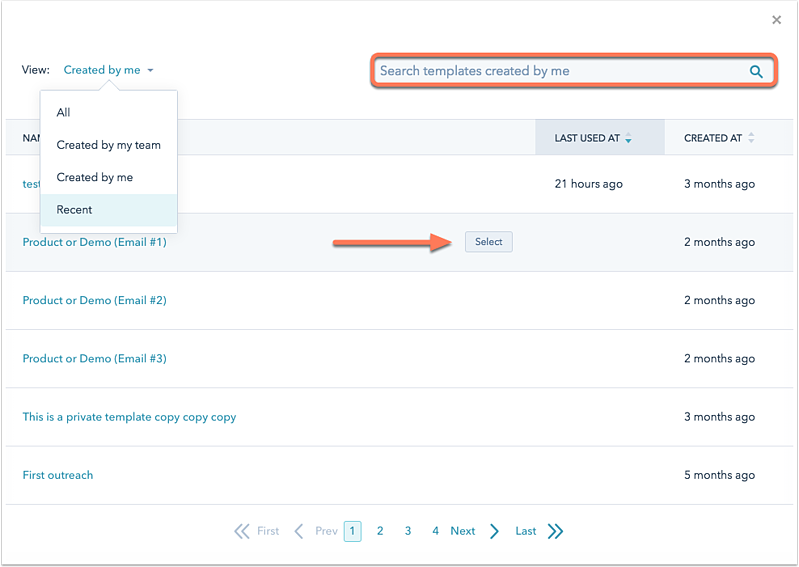 Specify the email template you want the sequence to start at, set delays between sequence steps, and specify times that you would like each sequence template to send. When you're ready, click Start sequence.